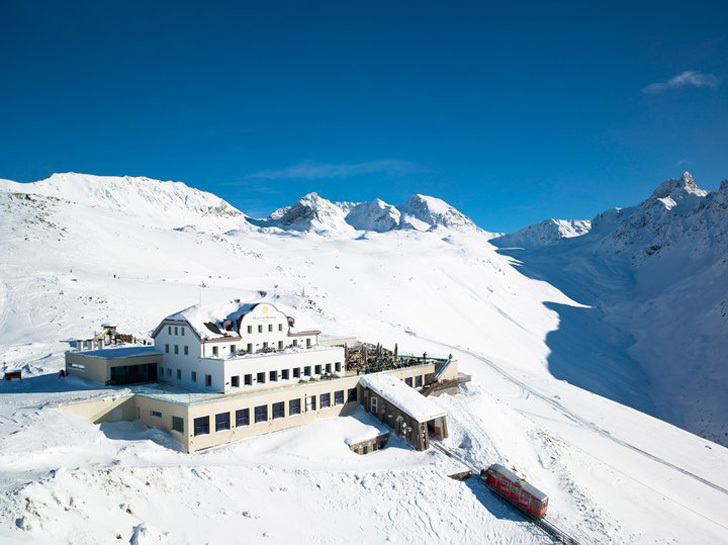 The incredible Berghotel Muottas Muragl is not just a favorite mountaintop resort for some of the world's most avid skiers - it's also the first energy positive hotel in all of the Alps. The 104-year-old lodge just completed a year's worth of renovations that incorporate renewable energy and sustainable living. Although the building doubled in size, its numerous solar panels, geothermal heaters, and low-impact materials have decreased the hotel's energy consumption 64% and put it on the map as one of the most luxurious green escapes in Europe. Found 8,000 feet above sea level, the Muottas Muragl is only reachable by helicopter or specialized trams that run on a strict schedule from the village below. Focusing on quality rather than quantity, the hotel offers 16 exclusive suites – each built from local Swiss stone, pine, and walnut. The renovation incorporated materials that offer long-lasting durability despite being exposed the toughest of elements. The hotel also offers a number of restaurants and a breathtaking terrace with panoramic views of the Alps. The hotel generates renewable energy through five sources, meeting the green standards of the Swiss “Minergie” ecological label. Solar paneled tubes along the basement windows harvest energy for the hotel’s hot water system. The most impressive feat of renewable energy, however, is the 750 long solar panel system along the tram railway outside the hotel. The photovoltaic panels are the most efficient ones available in Switzerland, and they generate enough energy for the entire hotel. Sixteen additional thermal loops coiled throughout the lower level of building supply geothermal energy and store any extra solar gain. The loops recover waste heat from other cooling units, exhaust air, and energy from the machine room. Besides the rave reviews from travelers all over the globe, the Berghotel Muottas Muragl is also the winner of the 2011 Swiss Solar Award and the 2011 PlusEnergieBau (PEB) Solar Award. Found 8,000 feet above sea level, the Muottas Murgal is only reachable by helicopter or specialized trams that run on a strict schedule from the village below. Focusing on quality rather than quantity, the hotel offers 16 exclusive suites - each built from local Swiss stone, pine, and walnut. The renovation incorporated materials that offer long-lasting durability despite being exposed the toughest of elements. The hotel also offers a number of restaurants serving traditional Swiss cuisine. 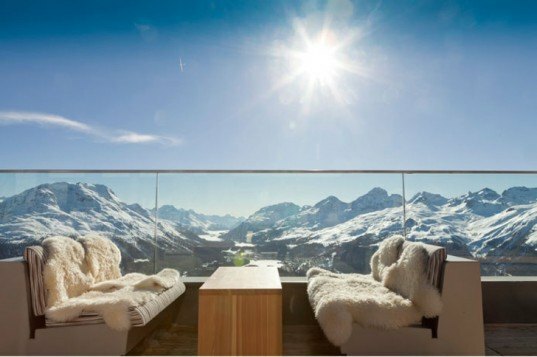 The breathtaking terrace boasts panoramic views of the Alps. The hotel generates renewable energy through five sources, meeting the green standards of the Swiss "Minergie" ecological label. Solar paneled tubes along the basement windows harvest energy for the hotel's hot water system. The most impressive feat of renewable energy, however, is the 750 long solar panel system along the tram railway outside the hotel. he photovoltaic panels are the most efficient ones available in Switzerland, and they generate enough energy for the entire hotel. Sixteen additional thermal loops coiled throughout the lower level of building supply geothermal energy and store any extra solar gain. The loops recover waste heat from other cooling units, exhaust air, and energy from the machine room. Besides the rave reviews from travelers all over the globe, the Berghotel Muottas Murgal is also the winner of the 2011 Swiss Solar Award and the 2011 PlusEnergieBau (PEB) Solar Award.